February 20, 2018 (LifeSiteNews) – The Vatican's former doctrine chief has penned an essay responding to senior Cardinals who have recently described Amoris Laetitia as a "paradigm shift" for the Church. 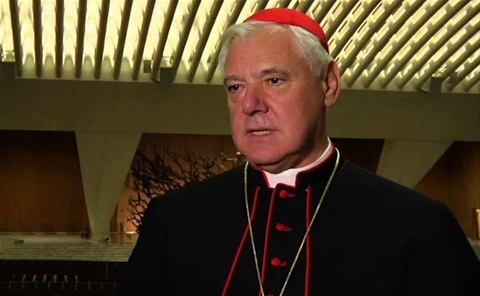 A “paradigm shift...by which the Church takes on the criteria of modern society to be assimilated by it” isn’t a “development” of doctrine, but “a corruption” of it, Cardinal Gerhard Müller wrote in a lengthy First Things essay. Müller is the former Prefect for the Congregation of the Doctrine of the Faith. Vatican Secretary of State Cardinal Pietro Parolin recently claimed that the controversial Amoris Laetitia is a “paradigm shift” for the Church. “The text itself insists on this, that’s what is asked of us — this new spirit, this new approach!” Parolin said. Müller, citing centuries of Church history and quoting Blessed John Henry Newman’s writings, laid out why a “paradigm shift” is really a rotting of Catholic doctrine rather than a “development” of it. For a development to be healthy, it must proceed in logical continuity with the teachings of the past. Is there any logical continuity between John Paul II’s Familiaris Consortio n. 84—which teaches that the divorced living in a new union must resolve to live in continence or else refrain from approaching the sacraments—and the change of this selfsame discipline that some are proposing? There are only two options. One could explicitly deny the validity of Familiaris Consortio n. 84, thus denying by the same token Newman’s sixth note, “Conservative Action upon the Past.” Or one could attempt to show that Familiaris Consortio n. 84 implicitly anticipated the reversal of the discipline that it explicitly set out to teach. On any honest reading of John Paul II’s text, however, such a procedure would have to violate the basic rules of logic, such as the principle of non-contradiction. ...in the exercise of its teaching ministry, it is not enough for the Church’s Magisterium simply to appeal to its judicial or disciplinary power as if its teachings were nothing but a matter of legal and doctrinal positivism. Rather, the Magisterium must seek to present a convincing case, showing how its presentation of the faith is in itself coherent and in continuity with the rest of Tradition. The authority of the papal Magisterium rests on its continuity with the teachings of previous popes. In fact, if a pope had the power to abolish the binding teachings of his predecessors, or if he had the authority even to reinterpret Holy Scripture against its evident meaning, then all his doctrinal decisions could in turn be abolished by his successor, whose successor in turn could undo or redo everything as he pleased. In this case we would not be witnessing a development of doctrine, but the dire spectacle of the Bark of Peter stranded on a sandbank. Pope Francis has not yet answered a dubia, or formal request, from four cardinals asking him if Amoris Laetitia is consistent with Catholic moral teaching. “They are orthodox only if they agree with the words of Christ preserved in the deposit of faith. Similarly, when cardinals, bishops, priests, and laity ask the pope for clarity on these matters, what they request is not a clarification of the pope’s opinion. What they seek is clarity regarding the continuity of the pope’s teaching in Amoris Laetitia with the rest of tradition,” wrote Müller.